NASDAQ Dubai is a stock exchange located in Dubai, United Arab Emirates (UAE) which lists regional and international shares. NASDAQ Dubai is located in the Dubai International Financial Centre, a financial free zone. The exchange is regulated by the Dubai Financial Services Authority. The exchange facilitates trading in equity, derivative products and bonds. If you are from Dubai or if you are trading in NASDAQ Dubai, then I am sure you might be searching for NASDAQ Dubai Holidays, NASDAQ Dubai Trading Calendar. 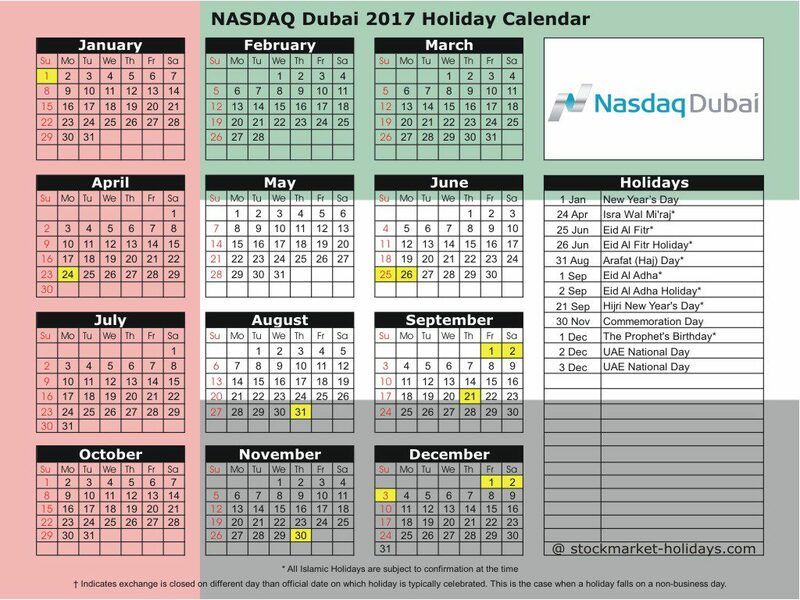 Below we have provided NASDAQ Dubai 2017 / 2018 Holiday Calendar. Live Quotes and Charts, Company Profile, Results, Corporate Announcements and all other information of all the securities trading on NASDAQ Dubai will be available on official website of the exchange.